Now that the weather is warm you should make sure you have the right items to dress up your outdoor table when you entertain. 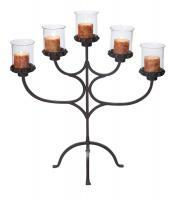 Bring a warm glow to your table with candleholders. There are so many style to choose from, it is easy to match your style. Table top candleholders and candleabras as well as free standing candleabras are great ideas to bring some light to your evening outdoor dining. Some of our favorites are shown here. For more great ideas visit www.cheapchicdecor.com.